Simply reliable - off- and on-road. A new design, new handling, new mobility. With the MAN TGS range you experience reliability pure and simple. The powerful common-rail engines and perfectly matched gearboxes unfold a superb driving performance with very good consumption values. You'll reach your destination quickly - even if it's off the beaten track - since the performance of the MAN TGS is unbeatable both on-road and off. 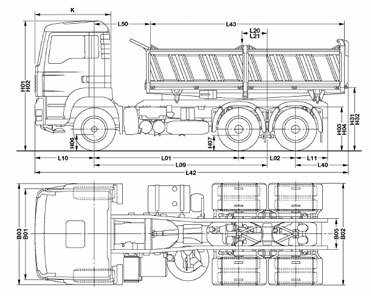 With its unrivalled and versatile wheel and drive formulae through to the 8x8 all-wheel-drive truck it offers you the entire range of mobility in the weigh class from 18 to 41 tonnes. The MAN TGS: The new standard for your work, build to keep you ahead of the competition. The TGS WorldWide is in a class of its own not only on the roads: under tough conditions it's one of the best too. 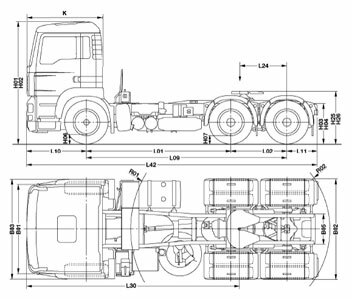 The robust six and eight-wheelers (6x4, 6x6, 8x4) come with the tandem planetary axle unit (13 and 16 t axle load), and that makes for a good ride. The differential lock is a standard feature. 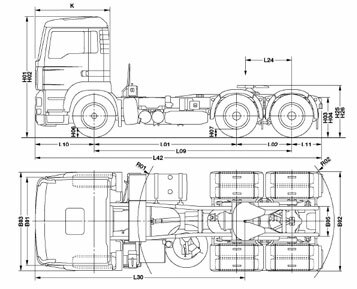 Depending on the particular needs there are two types of suspension for the heavy-duty vehicles: the parabolic springs guarantee very good ride comfort whether the truck is empty or laden; here MAN's long experience with parabolic springs for tough assignments pays off. Repair-friendly trapezoidal springs with layered auxiliary springs are recommended for trucks which do not often drive empty and need high overload reserves. 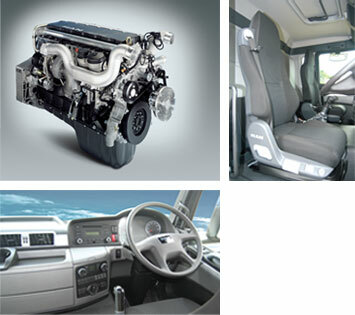 MAN's D20 Common Rail engines are regarded as the mostmodern in Europe. They ensure more flexibility for less consumption,more power for less noise, a longer life and easier maintenance than ever before and all that despite being 100 kg lighter than their predecessors. The robust D20 engines (Euro 2 version)supply 265 or 294 kW (360 or 400 hp). The Euro 3 versions with D20s with cooled exhaust-gas recirculation generate 257 to 361kW (350 to 430 hp).The powerful D26 and D28 engines even better this. These high-capacity in-line sixes feature superb power development at 353 kW (480 hp) as Euro 2 or Euro 3. The engines for the TGS WorldWide are fully equipped for the tropics. Largely responsible for this is the generously sized radiator, which comes as standard with a solid stoneguard. Even the standard seat is extremely comfortable, but the airsprung rocking seats are in a class on their own. They come in variants for any requirement: with pneumatic height adjustment, fast lowering and vertical damper adjustment, with pneumatic lumbar support, side contour adjustment, hydraulically damped horizontal suspension and adjustable seat cushion depth. The ultimate is the electrically adjustable rocking seat with memory for three seat positions. Again that's typical Trucknology® for you. And to ensure that jolts are kept away from the driver's back there are specially reinforced cab mounts that absorb even the hardest bumps from the road. 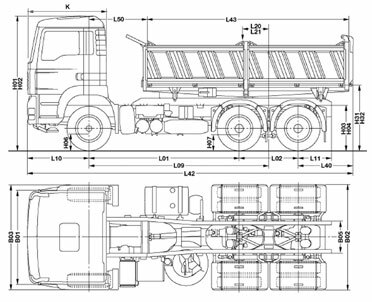 Front Axle : MAN VO-09, Straight, capacity 9 Ton. - Tyre :12.00 R 24.